Unless it has been changed before, the default email address is always the first email account that has been setup on the iOS device. But for those who use multiple mail accounts on their iPhone, iPad, or iPod touch, changing the default sending address is often important, since whatever is set as the default is what gets used by all other aspects of iOS when sharing through email, including photos or links, and this applies to Mail app as well as third party apps. Making a change is easy, and is particularly worthwhile knowledge for those who juggle a personal/home email and work email in the iOS Mail app, since it can help to avoid some awkward situations of accidentally sending something from the wrong email address. The change is immediate, once finished with the adjustment you can exit out of Settings and any mail actions will be sent through that default account. This simple setting has been misunderstood before because of the labeling, with “Default Account” showing the various email provider names, rather than something a bit more explanatory like “Default Address” showing the different email addresses. 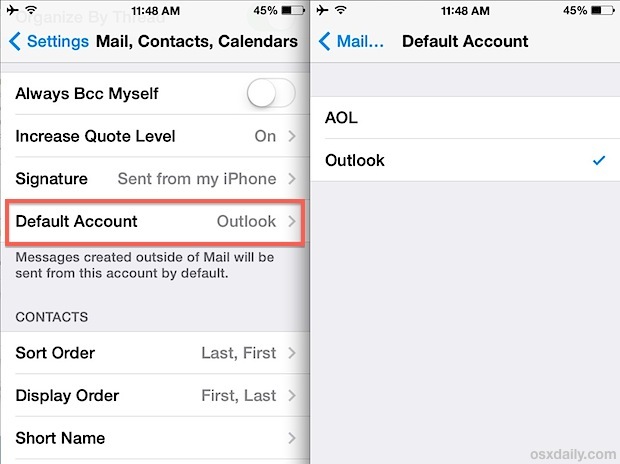 Note that “Default Account” is always shown directly under the changeable Signature portion of Mail settings. Prior to iOS 7 it’s always visible, but with newer iOS versions if you don’t see the “Default Account” option it’s probably because you don’t have multiple email accounts configured through the Mail app of iOS. Remember, Mail app is separate from other third party email clients and apps installed on the same iOS device, and thus the other apps will not be shown in the list. Want more email tips? Don’t miss this excellent collection of Mail tips to boost your mobile email productivity or browse through our prior Mail tricks collection. i was using juno for many years and just switched to comcast. what do i need to do in order to get my comcast email on my ipad? thank you for any assistance you may give. I have several email accounts on my phone. At first when I opened the mail app, it would just show a list of all my inboxes and stuff so that I could choose which one I opened. Now it immediately opens the default. How can I set it so I see the list and not only the first email account? Hello Ty, how have you solved this matter? I have a different issue, which is, when I open the mail app it opens directly on another e-mail account which is not the default… could you let me know how did you solve your problem. I have rebooted the iPad several times and tried changing the default a dozen times and it will not change the default. I have the same problem with my iPad 3 and my wife’s iPad 2. I am wondering if there is an issue with the latest update of iOS. It works! Thanks for sharing. I need to change my email account on my iPhone 6. When I go to Settings, there is no “Mail, Contacts, Calendars.” There are only individual “Mail” “Contacts” and “Calendars” none of which has a default option. I went onto Apple website, signed in and changed email address there and it now shows on my phone. When I click on mail, however, I still get the old email. ARGH! I have the same problem , i dont have an “mail, contacts and calendars” only individual ones. I really don’t know how to do it. Can you send me the link please where you signed in and change it ? Settings -> Mail -> Default Account (you will have to scroll all the way down to the bottom). Select Default Account, then select your preferred account. Doesn’t work. I have tried multiple times, rebooted, updated my phone…still doesn’t work. totally annoying and missing messages …. Anne, this is how you change the default email address on the iPhone. It does work, there is no other way to do so. Who knows what your problem is, but this is not it as it has nothing to do with missing messages.